I’ve been in the mood for some old fashioned baking. Especially since my attempts at making any salty dishes have lately failed miserably! Luckily this recipe succeeded beyond my expectations; I wouldn’t have thought such simple biscuits could taste so good. The recipe is an old one, and like the name suggests, it was a treat to eat with coffee for the finer folk. The ingredients themselves are really simple, as is the recipe itself. I made the jam myself, but you can use a store bought one as well. 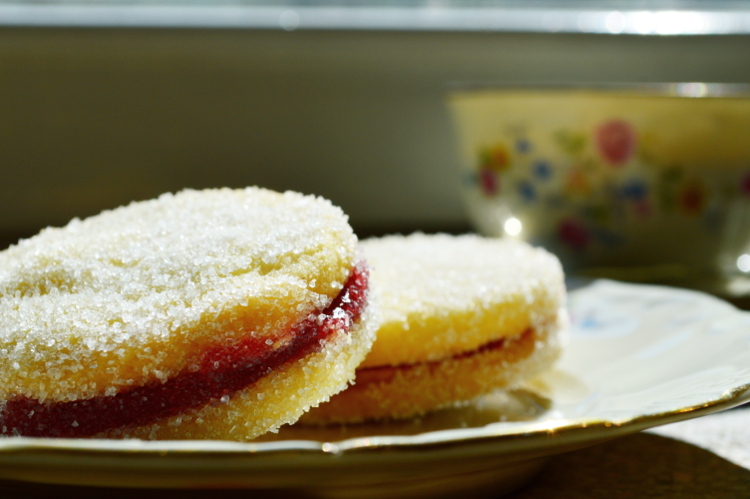 Traditionally the biscuits are with raspberry or apple jam, but I made these with strawberry-basil. If you want to make the jam yourself, it should be made first so it can cool down while you make the biscuits. Scroll down to the bottom of the page for the recipe. The butter should be semi-soft, so you should take it out of the fridge an hour before you start making the biscuits. 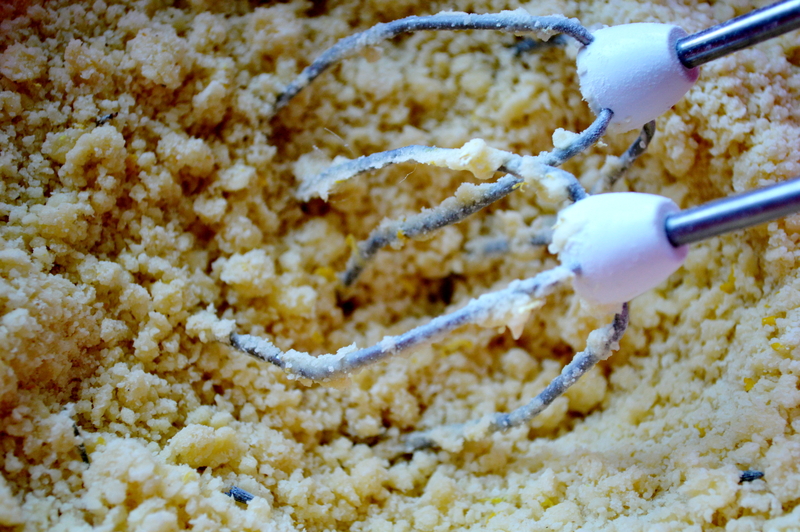 Mix the butter and sugars in a bowl with the dough hooks of the mixer. You don’t need to make it foamy since these will be shortbread type of cookies. 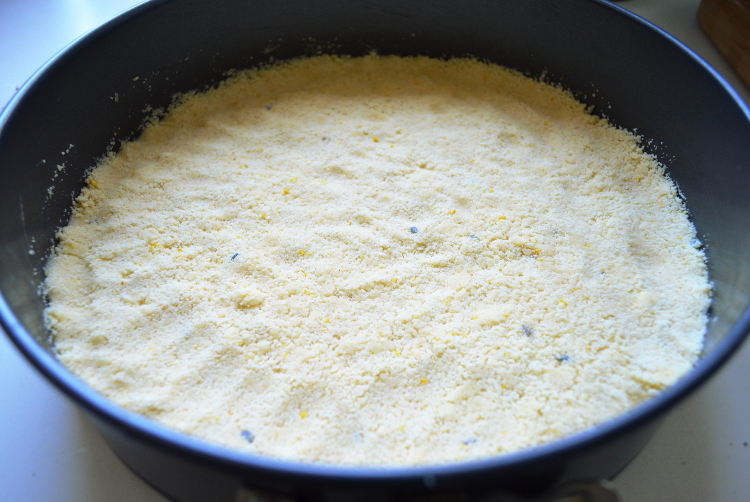 Mix the flour and the potato starch together and sieve it into the butter-sugar mixture. Whisk the dough quickly with the dough hooked mixer – do not knead it, or otherwise the cookies will be firm and not soft and crumbly. Let the dough rest in the fridge for an hour or so. Preheat the oven to 175°C and line a baking tray with parchment paper. Roll the dough out to about half a centimeter thickness. Use a bit of flour if necessary. Cut the biscuits with a round (4 cm or smaller, depending on your preferences) cutter and bake for around 7 minutes or until lightly coloured. Let the biscuits cool down. Spread some jam on half of the biscuits and sandwich together with the remaining ones. Roll them carefully in some sugar. If you’re using fresh strawberries, crush them in a large bowl until they’re mash. In a heavy-bottomed saucepan, mix together the strawberries, sugar and basil. Stir them on low heat until the sugar has dissolved, then increase the heat until the mixture boils. If you want the jam to be clearer in colour, take the foam off with a spoon. Stir the jam often and let it boil for 20 minutes. Take the jam off the heat and puree it with a hand blender. If you want to get rid of the strawberry seeds, pass it through a fine sieve and let it cool down. If there is jam left after filling the biscuits you can put it in a jar in the fridge. It will stay good for a while. 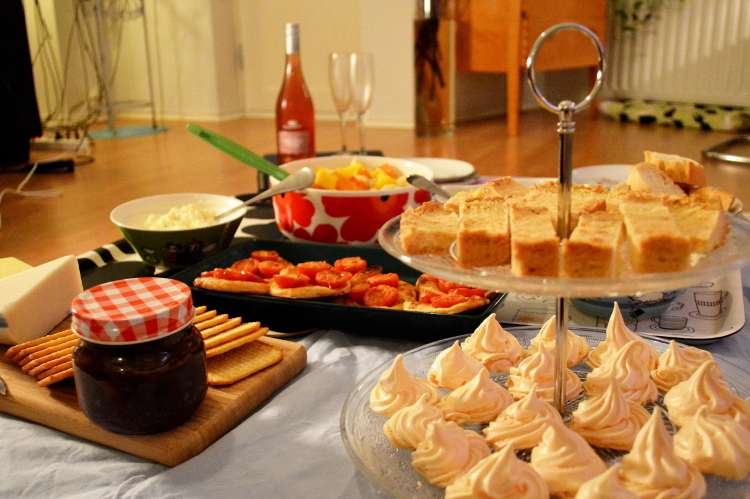 I made this a while ago when Tiia and I had an indoor picnic. The shortbread was really easy to make and my first try turned out really well. 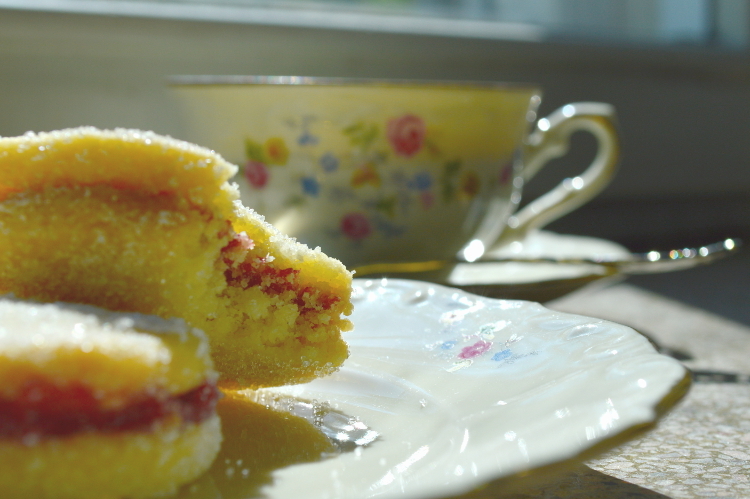 Today, as the sun is shining into the living room, I decided to make another batch so I could post the recipe here. It’s taken from Annie Bells’ “The Picnic Cookbook”, which offers a lot of fresh and easy recipes for picnics, barbecues and parties. Preheat the oven to 150°C and grease a baking tin. I used a 26 ∅ cm springform. It makes quite thin shortbreads, so if you want them thicker, you should use a smaller tin. Whisk the butter with the sugar and add the lavender oil. I only used 9 drops (the book recommended 15) because lavender tastes quite strong and I didn’t want to get the feeling of eating soap. I would advise to taste the batter after a few drops to see if it’s not too much for you. 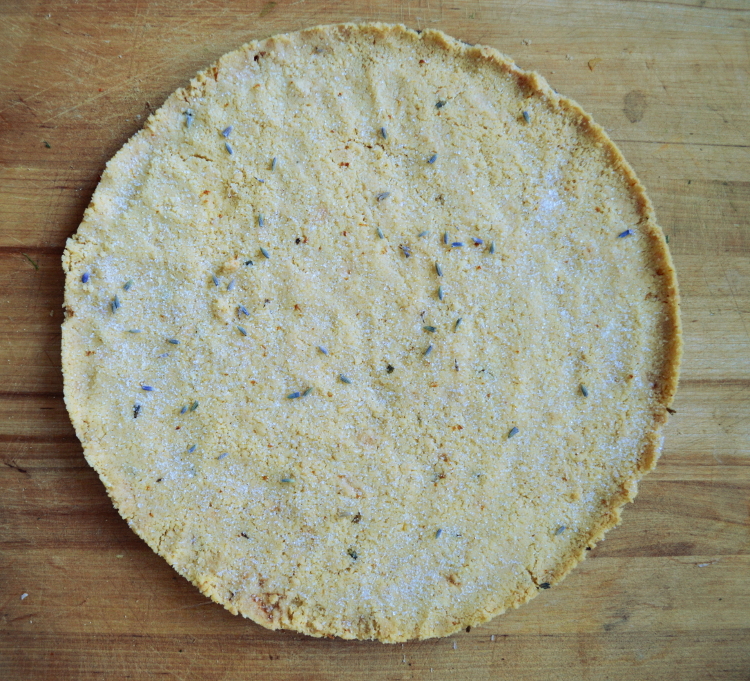 Add the flours, lemon zest and a few dried lavender flowers. Part of my rice flour was self-made since I had made rice milk from roasted rice last week. I let the leftovers dry and then ground them in the food processor. 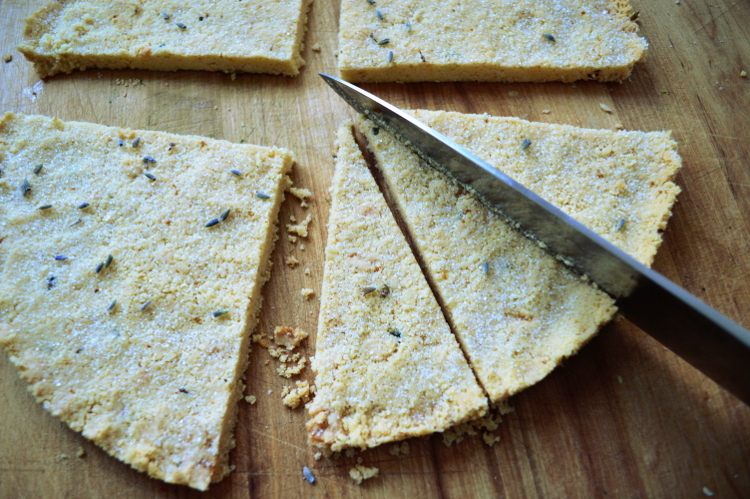 It was still more coarse than the bought one, but it seemed to be really nice for the crumbliness of the shortbread. However, you can of course just use normal rice flour. When everything is mixed, it should be all crumbly. Press it into the tin but be careful not to compress it too much. It should be still crumbly. Bake for 30 minutes, then put the oven off and leave the shortbread there for another 5 minutes. 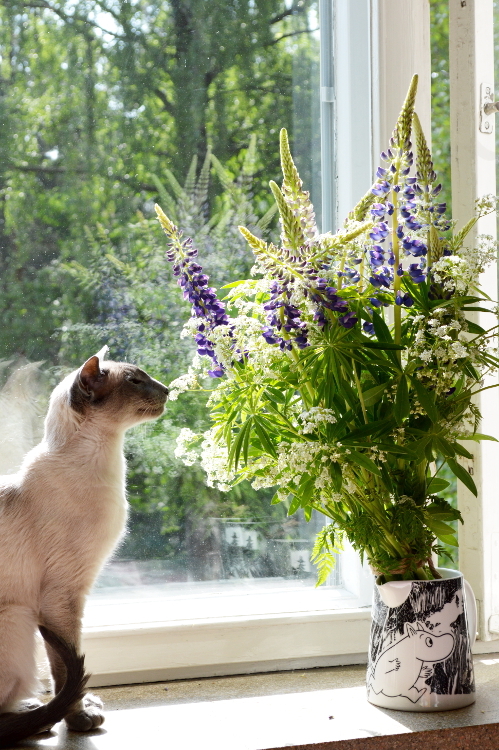 Take it out, sprinkle some sugar on top and some more lavender flowers. Let it cool down before removing the tin and cutting the shortbread. Enjoy! We love to have picnics in the summertime, hence we got this great book called The Picnic Cookbook by Annie Bell as a Christmas present. Unfortunately in Finland you can’t really have outdoor picnics in the wintertime, unless you enjoy eating in a meter of snow with -17°C. 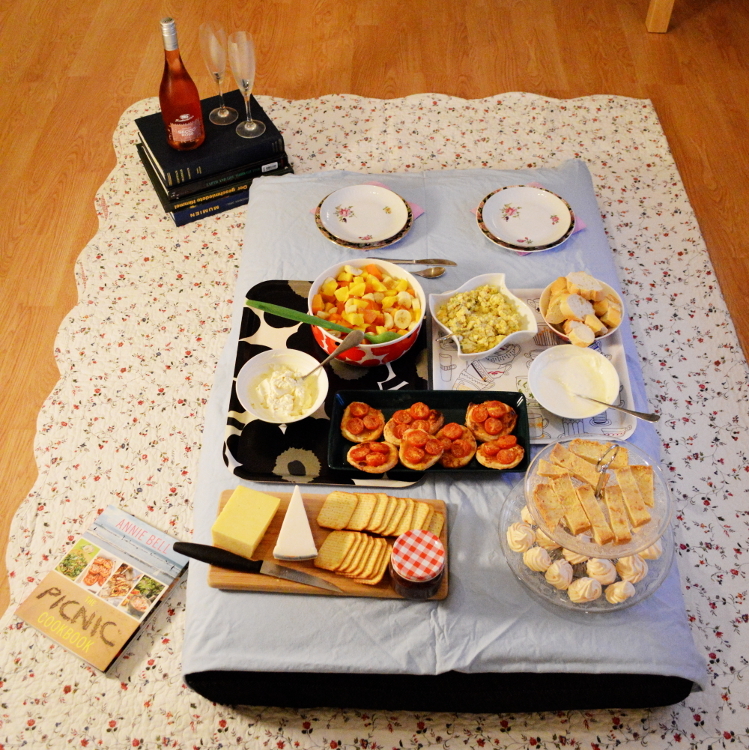 We decided to be rebels and make some interesting food from the book and have a nice picnic in the middle of our small living room. Some candles around, a bedspread serving as a picnic blanket and a makeshift table out of some sofa cushions and the setting was perfect. 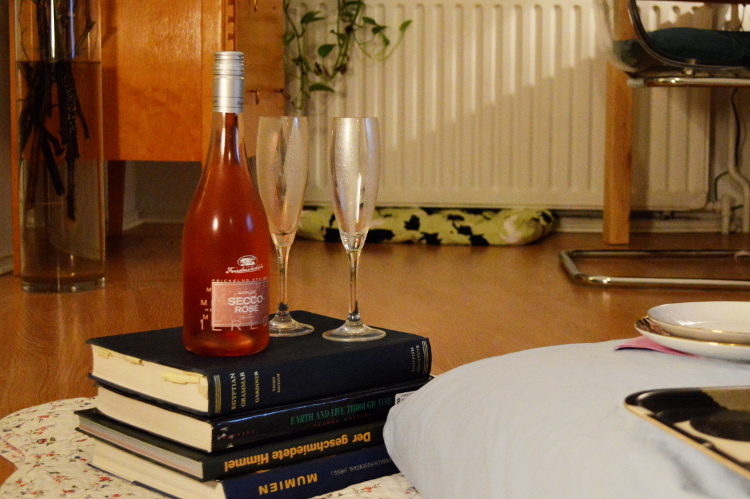 I can imagine this would be a nice idea for Valentine’s Day for those who want to celebrate it. There were some delicious ideas in the book, including gorgeous pictures and general tips. I have a feeling we’re going to read it through many times before the summer is even here. 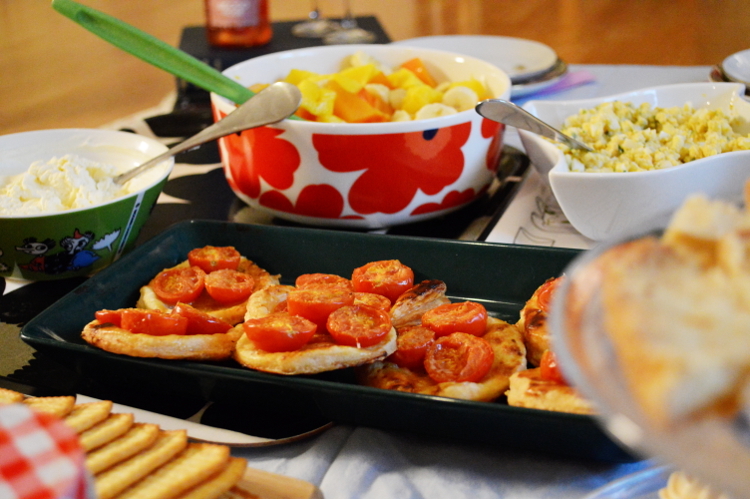 The cherry tomato and parmesan galettes were from the book, as was the lavender shortbread and the cheat’s aioli dip. The recipes were easy to follow and turned out really tasty. I recommend the book for other picnic enthusiasts! Stef also made onion jam for crackers with cheese and I made Pastéis de Belém, Spanish puff pastries with pudding. 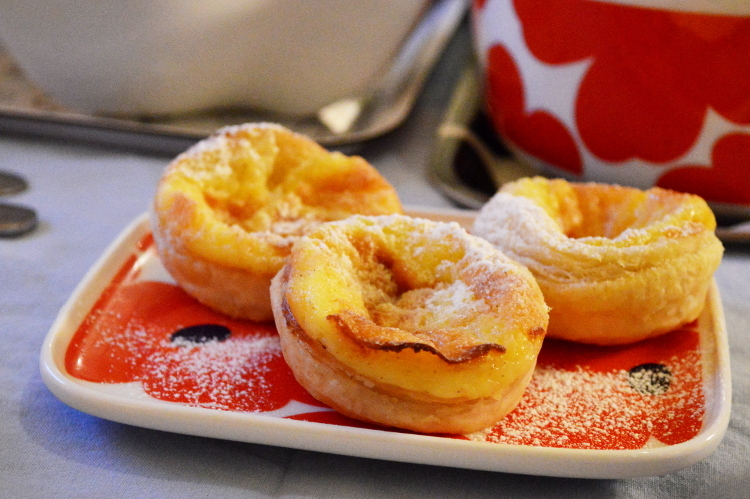 The tarts were delicious and really easy, I have to make them again, at least when I have left over egg yolk from making macarons or meringue. It was amazing to relax like this after a work week, I deeply recommend it. 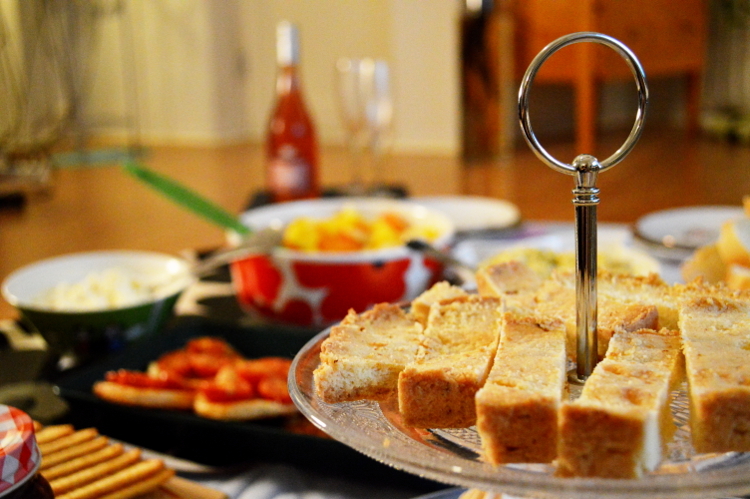 Let me know in the comments if you ever do something like this indoors and what are your favourite picnic recipes!